Adobe Premiere Pro is a Non-linear editor – A Non-linear editor allow you to start a video in any order or sequence you want. That means you can start a video in the middle, end or beginning and can move all the media clips (video, audio, graphics and still images), around until you have created the story you want. It’s also non destructive, meaning you can’t damage the original video files when you are editing. Project – A project in Premiere Pro is a collection or overall pieces, of the individual media clips. Clips, Media Clips – The clips or media clips include video, audio, photos, graphics, and tiles. Sequence or Timeline – The timeline or sequence is compared to creating a recipe for your favorite food. It’s the order you place the edited media clips to tell a story. Bins – A bin is where media clips are stored and act as a sub-folder in the Media Browser. Three Point Editing – The media file in the Source monitor has two points: In point, and Out point. The third point is in the timeline, marked with an In point. If the point isn’t marked on the timeline, the playhead is the third point. Lower Third title – The text is located on the lower third of the title and video, reducing obstruction of video. Crawling Title – The crawling title moves from left to right or left right. The speed must be adjusted to insure the text is easy to read. Keep the message short, adding details about a website or vita details. Rolling Title and Still Title – Rolling titles or Rolling credits is great for the end credits in a video. The text can start on or off the view of the video and roll upward and finish on or off the screen. The speed of the title must be adjusted for easy reading. This slide can be set as a still or non-rolling image. Exporting – A series of command for rendering videos, preparing for sharing. Uploading and publishing – After video is exported, video can be uploaded to internet and shared on YouTube, Vimeo, website and other options. Source Monitor – viewer of what you use, material selected in the Media Browser. Program Monitor – view tied to the timeline, what the edit video will look like. Timeline or Sequence – the area where current sequence is displayed, video and audio tracks, along with inserted clips. Audio Meters – Where you can look at volume levels, aiming for audio peaks about -6db, helping to make audio consistent while listening to audio, especially with headset or earbuds, reducing ear damage. Create project – File, new project or use the welcome window to create new project. Import media – In the Media Browser, Shift + 8, import Private folder on desktop or saved in video folder in Data HD or portable hard drive. Navigate in the Media Browser until you find the media clips you want to import. Right click on the Private Folder with your clips, select IMPORT. Save, command S.
View Content – Once clips are imported and in the Media Browser, double click on video clips to view in the Source Window, upper left corner in Premiere Pro. 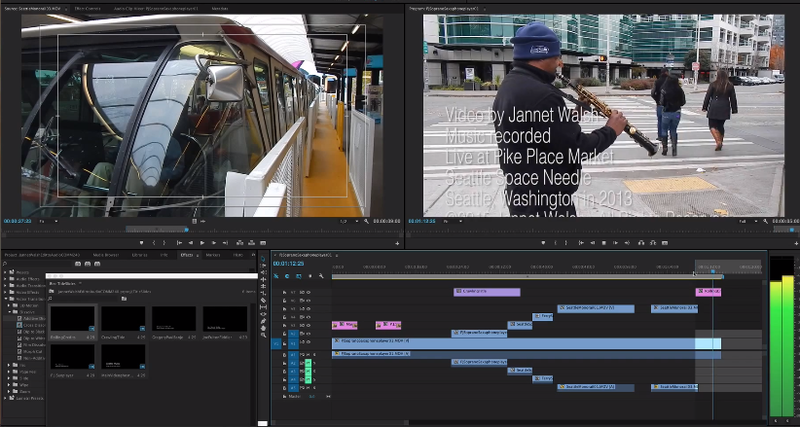 Add media clip to timeline -Adding first media clip – After selecting In point, (Letter I on keyboard) and Out point, (Letter O on keyboard) of a media clip in the Source Window, drag first clip to the timeline, lower right in Premiere Pro. After adding all media clips after the first one, an In point and Out point must be set in the source window and an In point, (Letter I on keyboard) must be set in the timeline. Then just drag the clip to the timeline. Safe Margins – Safe Margins help to insure your video or titles are display properly when displayed in different formats of TV or online. Method One – In the Program Monitor, upper right corner of Premiere Pro window, located the button for the Panel menu, upper right corner, looks like a small sandwich. Click on the panel menu, located Safe Margin and check. There should now be a double boxes. Inner most box for title safe and outer most for video safe. Method Two – The other option is to set the Safe Margins in the Source Monitor. Located the Settings, a wrench icon, and check Safe Margins. Add effects – Locate the Effects Panel in the lower left corner of Premiere Pro window, Shift + 7. Customize effects and add motion related effects in the Effects Controls – The Effects Controls panel is where you can customize and apply audio and video effects. Add Titles – Title are a critical component to production. The Premiere Pro Titler has presets and text. Create Title – Go to File, the New, Title. By default, title is configured to match the sequence. No need to change parameters, click OK and the new title is in the Titler. Now you can customize. 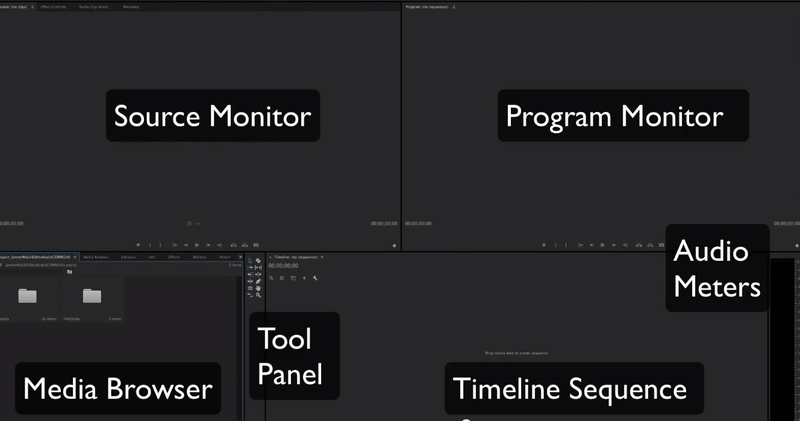 Tools Panel – The Tools Panel, located between to the left of the timeline, contains tools for editing in the timeline. There’s a Razor Tool used for splitting clips on the timeline. Other tools include selections, pen, ripple edit, rolling edit and more. Export – The video must be rendered or prepared after all the video editing is complete. A final video file will be prepared so it can be shared on YouTube, Vimeo or uploaded directly to a website. Posted in Adobe, Technology, VideoTagged Adobe, Adobe Premiere Pro CC, Premiere Pro, Premiere Pro CC, video editingBookmark the permalink.